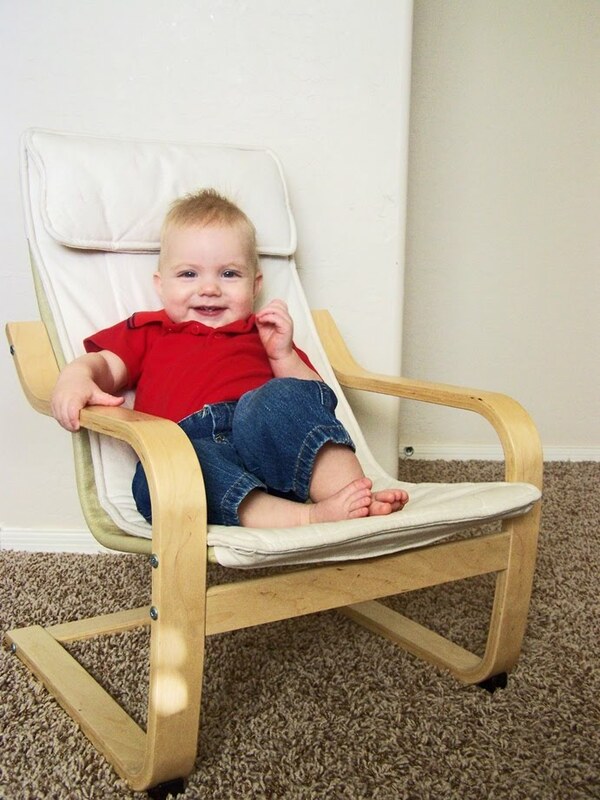 Mom, the Intern: 9 months and a chair. 9 months and a chair. Baby Guy has passed his 9-month mark (December 24), which means he has been ex-utero longer than he was in utero. How fun. Look at this cutie. It's really hard not to eat him. People who have seen him in real life can attest. Monday is his 9-month well-baby visit. He will get measured, poked, prodded and injected. Oh, what fun that will be! Although, as much hassle as they are, I always leave the well-baby visits feeling like a really good mom. My babies are big, I guess, so the doctor usually says things like, "He's right on target!" and "Good job!" which gives me a huge boost of confidence. Even though I know I'm just blessed with easy babies and not necessarily a good mom. I mean, anyone could be a good mom to my kids. They are really even-tempered. And sturdy, I might add. I guess what I mean to say is, I'm a good mom, but my kids make it a piece of cake. Speaking of cake (and other goodies), how is everyone doing after all that lavish holiday feasting? I think I ate way too much last weekend. Plus, I have an unholy amount of candy in my pantry. I think we're covered until at least February. You are too a good mom, silly! I'm glad your kiddos are easy-going though, that's definitely a plus! I can't believe that he is so old already! :) Before you know it, it will be his birthday!! Love the outfit.